National Awards for Innovative Practices and Experiments in Education for Schools and Teacher Education Institutions. The National Awards scheme was reviewed by the NCERT during 2005-07 with the help of faculty members of RIEs and some external experts in the area of school education and teacher education. 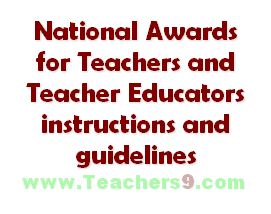 The review led to the reformulation of the Scheme as „All India Competition on Innovative Practices and Experiments in Education for Schools and Teacher Education Institutions.‟ After the implementation of the Scheme for about ten years, it has been felt that individual teachers and teacher educators attempting innovations need to be accorded recognition by giving them awards at the national level. Therefore, the scheme has been rechristened as ‘National Awards for Innovative Practices and Experiments in Education for Schools and Teacher Education Institutions’ from 2017-18 on wards. create an environment in schools and teacher education institutions to ensure sustainability of innovation; and provide a forum to teachers and teacher educators to share their innovative ideas with all the stakeholders. Teacher of any recognised Special Education School. Faculty members of State Councils of Educational Research and Training (SCERTs) and State Institutes of Education (SIEs) offering teacher education programmes. Teachers and teacher educators shall submit project proposal in given format to the Principal, Regional Institute of Education (RIE) of the region concerned (Annexure-1) latest by 31st July every year.